I’m back today with a card for the Watercooler Challenges – it’s WCC21 – and this time it’s a colour challenge, by my talented friend Susan Horr! If you haven’t yet checked out Susan’s blog, or the Watercooler Challenge blog, you really should! Just click on the names; I’ve provided direct links for you! Here are the colours that Susan chose for us to use: Bermuda Bay, So Saffron, Calypso Coral, Pool Party and Sahara Sand. Plus – this is another way to use that cute Berry Basket Die! All you have to do is die cut only the bottom 1/2 of the basket (just above the score line), and cut 1/2 of the basket trim. I decided not to include the handle, but you can certainly do that, too. I cut the basket from Sahara Sand cardstock, and sponged the edges using a Dauber and Crumb Cake ink. For the flowers, I used a few different sets; Crazy About You, Flower Patch, Petite Petals and Flower Shop. Of course I used the challenge colours for the flowers; Calypso Coral, Pool Party, and So Saffron. The only colours I included that weren’t part of the challenge were for the leaves; I used the Flower Patch set, with Pear Pizzaz and Old Olive inks. I then used the coordinating punches & dies to cut out the flowers & leaves – I just LOVE it when I can do that!! Thank you, Stampin’ Up! 🙂 I used the Pansy Punch (for Flower Shop), Petite Petals punch (for Petite Petals), and the matching Flower Fair Framelits Dies for the Flower Patch flowers & leaves. If I had the 1 3/4″ Scallop Circle Punch, I could’ve used that for the Crazy About You flowers – but I don’t, so I hand cut them. I attached everything to the Bermuda Bay card base using Stampin’ Dimensionals, and tied some White Baker’s Twine around the basket. I then used the sentiment from Crazy About You (actually 2 separate words that I lined up), stamped in Bermuda Bay ink. 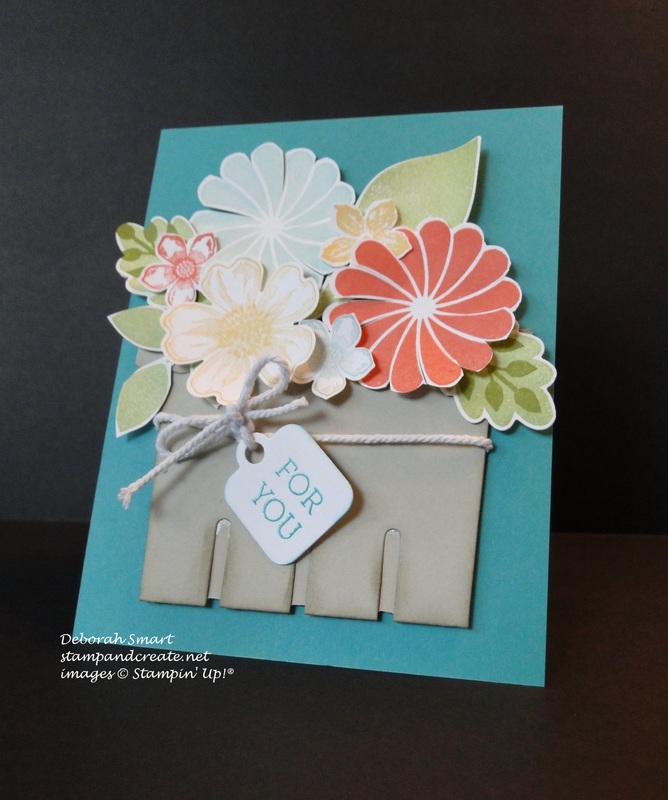 I then used the tag die from the Curvy Keepsake Box Thinlits Die, and attached it. I hope you’ve enjoyed my card for this challenge; please leave me a comment if you have time, and let me know what you think! And if you have a chance, check out both the Watercooler Challenge page (you know you can enter the challenges, too!) and Susan’s blog, for more creative inspiration. Next Next post: Stamping Fun with Kits! What a great card, Deb. I’ve seen the basket die used like this and am determined to try it myself. It certainly makes a wonderful pot for those flowers. Thanks for joining us for the Watercooler Challenge. 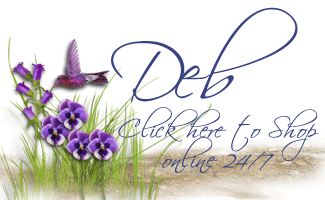 Deb, your work is always wonderful! Very cute, Deborah – and so clever to use the berry basket die. Great use of the colors! Deborah what a beautiful card. Your different use of the berry basket is just awesome! I love how you combined the various flowers to make such a perfect arrangement. Thanks as always for inspiring me to create, I simply love coming to your blog and seeing all your great ideas and creativity! Happy Spring! Deborah, really clever – another great use of the berry basket die.